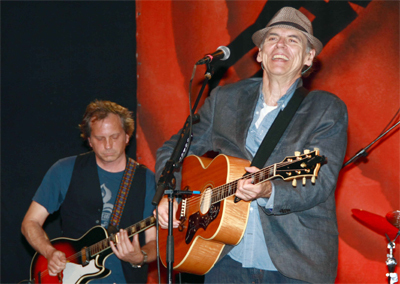 John Hiatt is an American rock guitarist, pianist, singer, and songwriter. He has played a variety of musical styles on his albums, including new wave, blues and country. Hiatt has been nominated for several Grammy Awards and has been awarded a variety of other distinctions in the music industry. He remains one of the most respected and influential American singer-songwriters. In 1992, Cooder, Keltner, and Lowe again backed up Hiatt, but this time they gave themselves a band name, Little Village. Expectations for the Little Village album were high, but the album failed to even chart as high as Hiatt’s last solo album, and the group disbanded after an only moderately successful tour. In 1993, Hiatt recorded Perfectly Good Guitar with members of alternative rock groups School of Fish and Wire Train. Hiatt recorded the album with producer Matt Wallace, who had worked most prominently with Faith No More, a band that Hiatt’s 15-year-old son Rob had recommended for him. It was Hiatt’s highest peaking album at No. 47, but again was still not the true commercial breakthrough A&M expected. In 1993, Love Gets Strange: The Songs of John Hiatt, a compilation album of covers of Hiatt’s songs was released. This was followed by an album of original covers Rollin’ into Memphis: Songs of John Hiatt, and a second compilation album with a few originals, It’ll Come To You…The Songs of John Hiatt. In 1994, Hiatt released Hiatt Comes Alive at Budokan?, his first official live album and his last album with A&M Records. A CD and DVD of his performance on Austin City Limits was released in 2005. Hiatt had previously released two promotional live promotional “official bootlegs”, Riot with Hiatt in 1985, and Live at the Hiatt in 1993, as well as the EP Live at the Palace in 1991. Hiatt received his first Grammy nomination in 1995 for his album Walk On. Hiatt’s next few albums never gained any momentum on the charts, and he saw little change in his fanbase in the late 1990s, indicating a dedicated following. 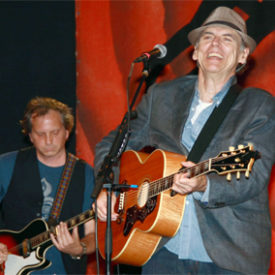 In 2000, Hiatt released his first independent album on Vanguard Records, Crossing Muddy Waters, which saw a heavy influence of bluegrass in his music. Later that year, he was named songwriter/artist of the year at the Nashville Music Awards. In 2001, Crossing Muddy Waters was nominated for a Grammy Award for Best Contemporary Folk Album, with Davey Faragher and David Immerglück as his only accompanists. Hiatt’s album, Master of Disaster, was released on June 21, 2005. The album was produced by Jim Dickinson, and Hiatt was backed up by the bassist David Hood and several members of the North Mississippi Allstars. The album achieved modest sales, becoming a top ten independent album, but eluded significant commercial success in the same manner that his previous albums did.